Also written 棹縁天井. A board and batten ceiling. A simple ceiling made of lightweight boards laid in one direction over regularly spaced battens *saobuchi 竿縁, placed at a right angle to the boards. The battens are usually spaced 30 to 40 �p apart and made of cypress, cedar, bamboo or occasionally of small, unstripped red pine or cherry branches. Perhaps the earliest use was in monks' dwellings *soubou 僧房, of the 7- 8c. It was also used in ordinary dwellings, juutaku 住宅, and sometimes even used in formal rooms *zashiki 座敷. In temple buildings the board and batten ceiling is usually found in the aisles *hisashi 廂, in sections of the core *moya 母屋, and in the worship area *raidou 礼堂. In *sukiya 数奇屋 style buildings that incorporated features of tea ceremony houses, the battens are often left in a natural, rough condition. In the formal shoin style *shoin-zukuri 書院造, the corner edges are carefully squared. Viewed in cross section the ceiling reveals several distinctive details. Saruboomen 猿頬面, a batten with six-sided chamfers, was used from the Kamakura period onward. A simple type of batten, hirabuchi 平縁, is typified by a flat rectangular cut. Other battens are chamfered at a 45°angle *kirimen 切面. To prevent sagging of the boards or the appearance of gaps, small slip fasteners *inago 稲子, were attached to the reverse sides. 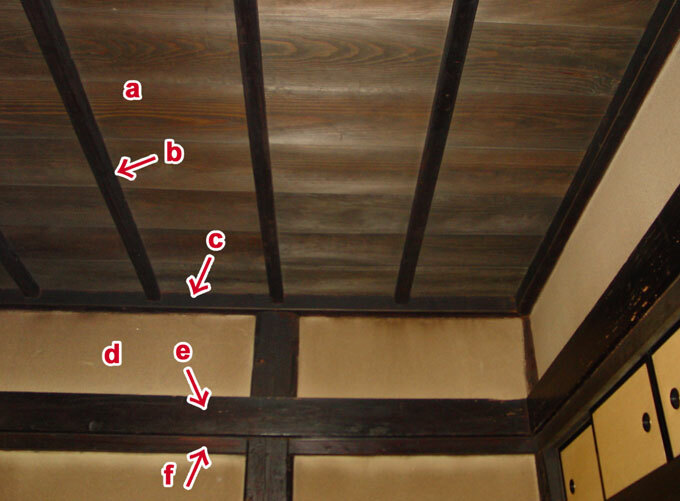 Slip fasteners were unnecessary if the boards were secured by scarf joints *sogitsugi 殺継.